The future of workplace design is no longer based on trends or what is fashionable. Smart workplace designers are now working with evidence-based data to create spaces that are outcome-focused to promote wellbeing at work and the unique culture of any given organisation. A uniform approach is no longer appropriate. The reinforcement of an organisation’s brand is one of the main outcomes of workplace design – and the attraction and retention of staff is another – but the most salient outcome of workplace design in the world today is the concept of wellness and wellbeing. 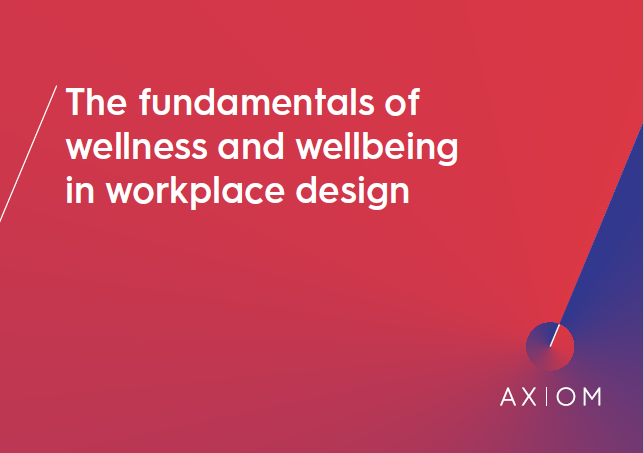 In this eBook, Axiom showcases the seven principles of designing for wellness and wellbeing at work, which include agility in the work environment, impacts of technology and the demands of a multi-generational workforce. Please complete the form to get your free copy of the eBook.